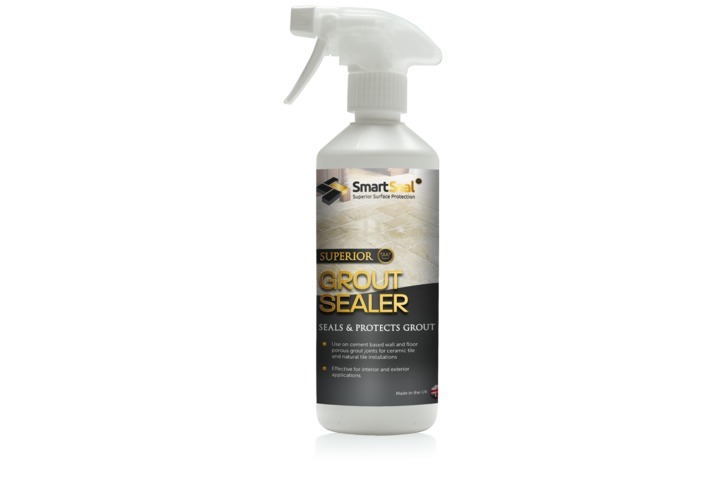 Home Kitchen & Bathroom Grout Sealer - 500ml - Seals & protects grouting on wall & floor tiles. Invisible finish. Superior Grout Sealer is a solvent free grout sealer that resists water, and oil based contaminants. 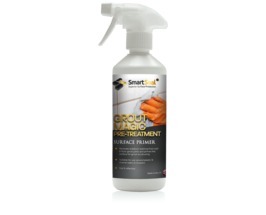 Simplifies maintenance and does not change the appearance of the grout whilst allowing for moisture vapour transmission. It is used as a grout tile sealer for floor and wall tiles. 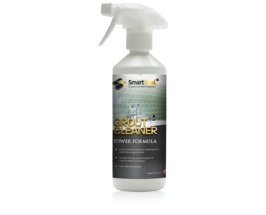 As a grout protector it helps prevent mould and mildew on tiles in Bathrooms & Kitchens. 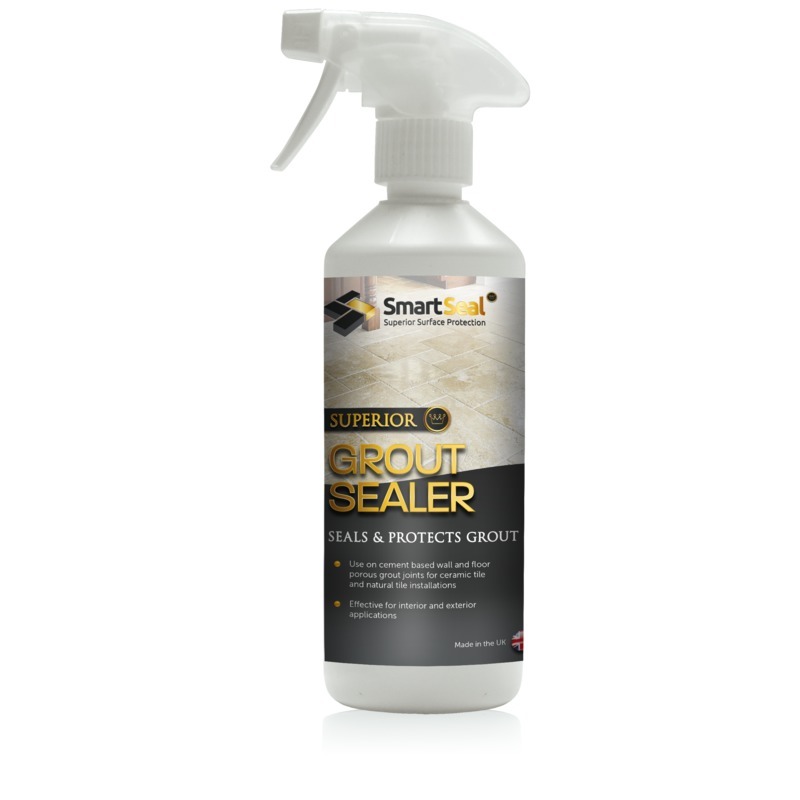 Superior Grout Sealer works as an effective grout protector and is used in conjunction with other internal sealers and stone cleaners from Smartseal. If mould or mildew are present, use Mould and Mildew Remover first before the application of the Grout Sealer. 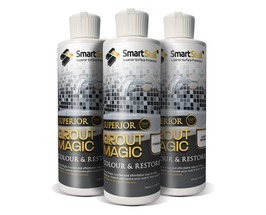 If you want to change the colour of existing grout use Grout Magic, an amazing grout restorer far superior to a grout paint or grout pens. 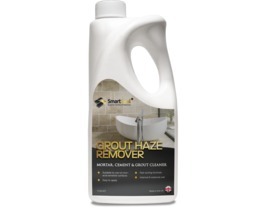 Use Grout Cleaner to ensure grout joints are clean, dry and free of existing sealers or coatings. Apply the Grout Sealer using a soft-bristle paint brush or sponge applicator. Apply a second application, allowing a minimum of 30 minutes drying time between coats. After 2 hours conduct a test to determine if surface is completely sealed by applying water droplets to the surface. If water is absorbed, apply an additional coat. Wait 2 hours and repeat the test. Ready for surface traffic 2 hours after final coat. Sealed area should be kept dry for minimum of 12 hours. Achieves full cure in 24 hours. May be reapplied as needed to grout joints that are clean. Always test a small area according to application instructions, with a 24-hour cure time to determine desired results. LIMITATIONS: Do not allow sealer to dry on tile surface because a residue will be visible. Do not allow sealer to come in contact with any non-recommended surface. Sealer will not prevent surface wear from etching from acids or caustic chemicals. Approximately 15m2 to 60m2 per coat per 500ml, depending on porosity of grout joint and method of application. For example, on a 30 x 30 cm tile with a 3mm grout joint a 500ml bottle will cover approximately 40m2 for 2 coat application. Will vary depending on porosity and texture of surface, type of area, surface wear, frequency and type of maintenance products used. The expected wear is up to 5 years. Extreme weather conditions, harsh cleaning methods and high alkaline or solvent-based cleaners will affect the longevity and performance. Close container after use. Store in original container only. Store and use in temperature between 10°C and 27°C. Protect unused, stored product from freezing.